TAINAN, Taiwan – The world’s top-four ranked nations scored victories, while Mexico tossed a no-hitter to open the 2015 WBSC U-12 Baseball World Cup on Friday at Tainan and Kiui-Jen stadiums. The 2013 U-12 World Champions, No. 2 USA, used power on the mound and at the plate to avenge a 2014 loss to No. 16 Nicaragua. The two nations last met in the finale of the U-12 World Cup Americas qualifier in Matzatlan, Mexico, where Nicaragua took the title. In Tainan, a trio of U.S. pitchers combined for 10 strikeouts, while only giving up three hits to Nicaragua. Three Samurai Japan pitchers combined for a one-hit shutout against No. 14 Australia. The world No. 1 won the bronze medal at the 2013 U-12 Baseball World Cup. For Australia, it is the first time in history that a nation from Oceania is represented at the U-12 world championship. The 2011 U-12 silver medallists, No. 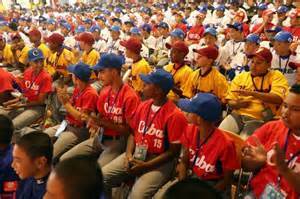 3 Cuba, defeated the 2014 European U-12 champs, Russia, 13-0, in five innings. Cuba's starting pitcher racked up 10 strikeouts and only gave up one hit en route to the victory over the world No. 32. In a match-up between rivals No. 4 Chinese Taipei and No. 8 Korea, the host nation used five runs in the fifth inning to break up a 2-2 tie and eventually win the hotly contested game, 7-2, in front of a crowd of more than 4,000. No. 12 Mexico only allowed one base-runner in an 18-0, near perfect effort against No. 27 France. In an all-South America match-up, No. 10 Venezuela scored eight unanswered runs in the final two innings to overcome a 4-3 deficit and defeat No. 15 Brazil, 11-4. 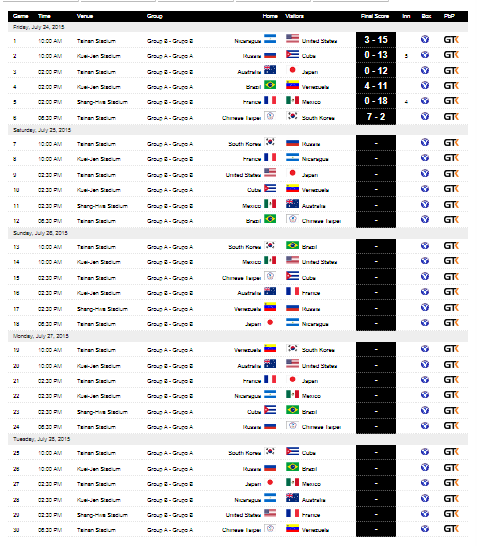 Venezuela and Brazil collected 11 and 10 hits, respectively. All twelve nations will return to action on Day 2, with world leaders Japan and USA among the feature contests.